Kaju Katli - Cashew Fudge sweet | Authentic Vegetarian Recipes | Traditional Indian Food | Step-by-Step Recipes | Give Me Some Spice! Kaju Katli – Cashew Fudge sweet is one of the easiest Indian sweets, with very few ingredients, to make and it’s perfect to eat during the Shravan month’s fast. 1. Grind the cashew nuts. I used a coffee grinder but any dry grinder is suitable for this. Using a sieve with largish holes, sieve the cashew powder and re-grind any of the big pieces left. 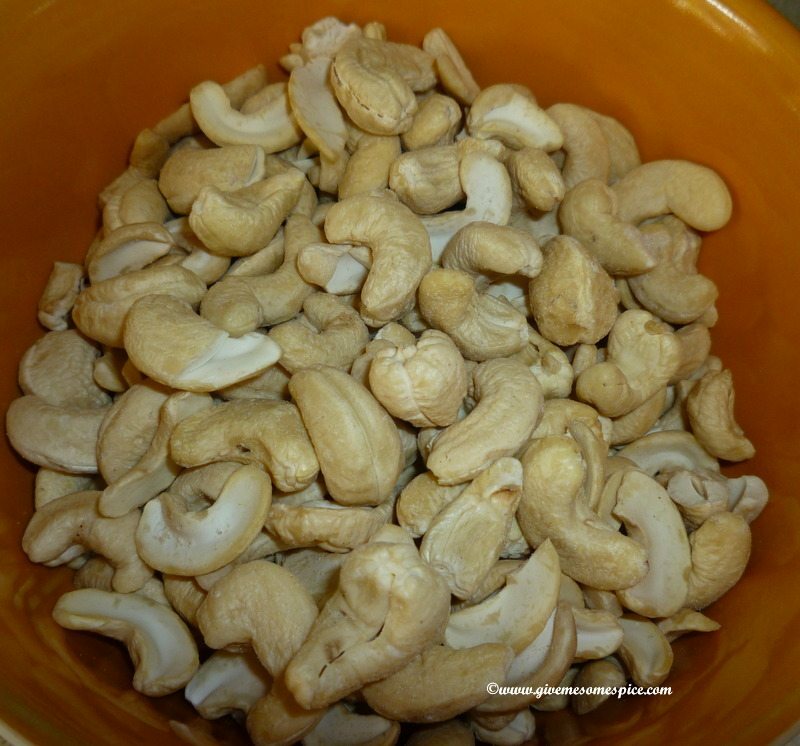 At the same time remember not to grind the cashews too much as they will start to release their oils. 2. Transfer the cashew powder to a microwave proof dish and heat the cashew powder for 2-4 minutes, stirring in between. This takes away the raw taste of the cashew nuts. 3. In a saucepan, add ¾ cup of water to the sugar and heat the mixture until the sugar dissolves. Keep this boiling for about 10 minutes and add the saffron and cardamom powder. Dip a wooden spoon into the sugar syrup to check the sugar consistency. To find the correct consistency – touch your fore finger on the sugar syrup. Touch this finger to your thumb and pull apart gently. The sugar will feel sticky and should pull apart in one string. This is called the one string consistency. You may have to keep testing the syrup to get the right one string consistency. One you get the sugar syrup to one string consistency – add it to the cashew powder and mix well. 4. Transfer the cooked mixture to a greased dish. Using the back of a spoon or a very small flat bottomed bowl, press the mixture into the dish and make it nice and smooth. Allow Kaju Katli – Cashew Fudge sweet to cool. 5. Once cool – cut Kaju Katli – Cashew Fudge sweet into little diamond shapes as traditionally this is the shape given to Kaju Katli. These little Kaju Katli – Cashew Fudge sweet diamonds can be stored in a tin and can be stored up to a fortnight. Can you think of any Indian sweet that is easier to make then Kaju Katli?